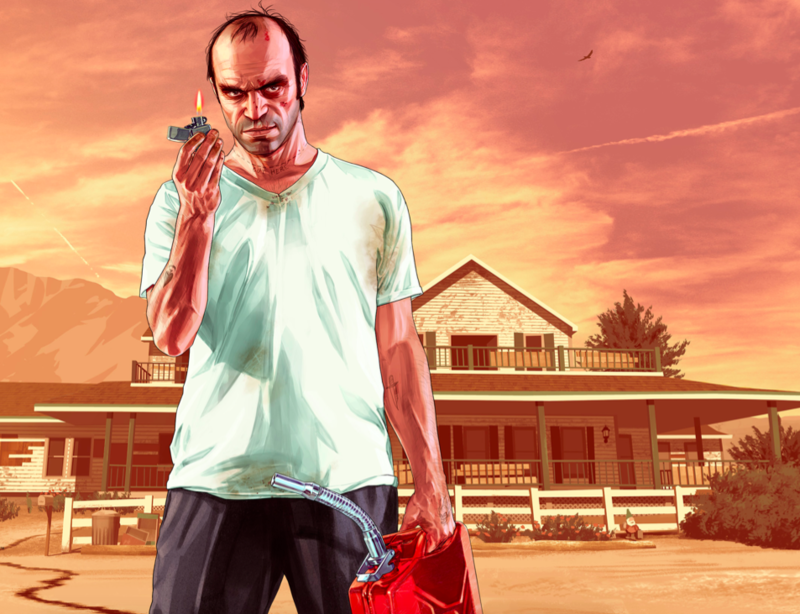 A year after launching on last-gen consoles, Grand Theft Auto V has finally made the move to PlayStation 4 and Xbox One. Not a moment of that time was wasted, writes James Cullinane. Grand Theft Auto is a phenomenon that transcends gaming and captures the cultural zeitgeist even as it gleefully ridicules it. It’s a byword for modern gaming and it has cachet far beyond its engaged audience. It’s an entertainment juggernaut so massive that even faded starlettes desperately attempt to attach themselves to it like coked-up, Hermès-toting remora fish. Despite a hugely successful launch in September so close to the new generation of consoles, Grand Theft Auto V remained doggedly – to some disappointingly – last-gen. Grand Theft Auto V’s arrival on new-gen had the air of inevitability to it, but for a game so ubiquitous the question of whether to buy it again on PlayStation 4 or Xbox One might be altogether more difficult to answer. The narrative is one of the few aspects of Grand Theft Auto V that has made the transition to new-gen largely untouched. Set in a clever rendition of southern California, Grand Theft Auto V is a satirical crime epic that sends up an increasingly fractured and hysterical American culture in the wake of the global financial crisis. Three men, Michael, Trevor, and Franklin, fall in with one another and become entangled in a tale of deceit, coercion and criminal fraternity fuelled by their peculiar talent for heists. The player can switch between these three characters at any time when they’re not on a mission. When they do so, the camera pulls out to a satellite view and drops in on the selected character in medias res. It’s still one of Grand Theft Auto V’s most striking features, and it perfectly sells the conceit that these characters lead independent lives outside of the times we see them. 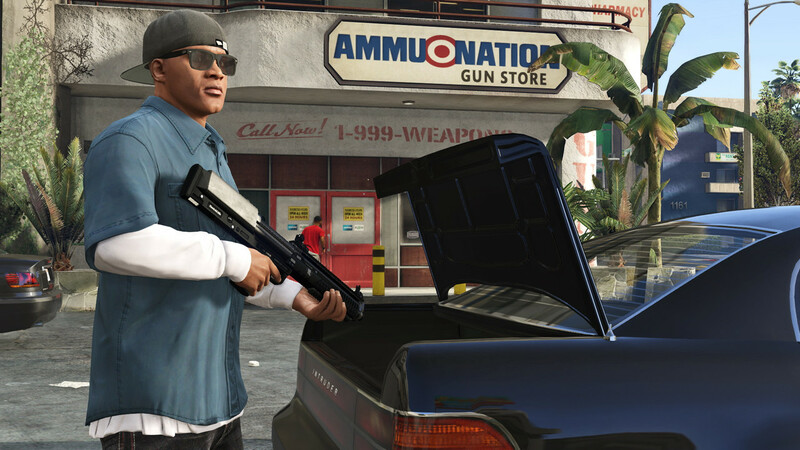 Heist missions remain the tentpoles of Grand Theft Auto V. These are missions with multiple components that include reconnaissance, preparation, and execution. Players choose from subtle or aggressive ways to pull off each job, and will be able to choose which non-player criminals assist them. The more talented the criminal, the bigger their cut of the final profits. Almost everything else has been redressed. The new hardware means Blaine county and Los Santos have been realised in much greater detail. Traffic on the road and on sidewalks is denser. Tall grass covers hillsides and bends and sways as characters and creatures move through it. First-person mode headlines the new-gen feature list, and it adds a substantial dose of immersion to the gameplay. Running at 1080p, every texture in the game has been touched up, pedestrians are more detailed, and car interiors have all been modeled so that they can be scrutinised while driving. To make first-person work, more than 3000 animations have been added to the game, and they range from everything you’d expect such as weapon reloads and jabbing punches to unexpected touches such as Michael hitting his steering wheel when he’s frustrated in traffic. These animations have been grafted so successfully to a familiar experience it can be difficult to remember that they’re altogether new. The options that come with first-person mode also speak to the substantial effort that went into adding this new perspective. Players can preset camera behaviours so that the game automatically responds to particular situations. For example, players can set the camera to automatically snap to third-person when entering cover. Cover is an essential element in Grand Theft Auto V’s combat design, and Rockstar has done very well to accommodate it in first-person, but for me there’s no question that the visual language of the game’s combat is much more readable in third-person, and that's how I set the game up to respond. Whatever your preference may be, it'll be accommodated as well. The world of Grand Theft Auto V is still by far its most brilliant aspect, and it remains a remarkable achievement. 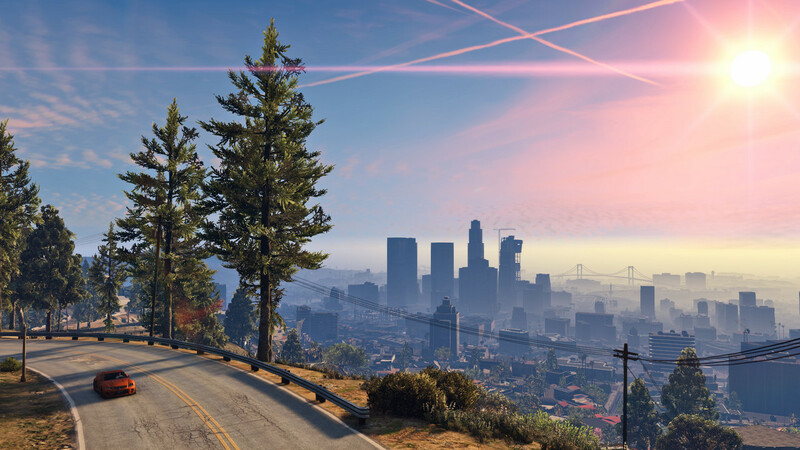 Los Santos and Blaine County are personalities in themselves, characters to spend time with. As a compact duplicate of Los Angeles, Los Santos is extraordinary. Famous and not-so-famous landmarks are diligently replicated and rebranded as cheeky nods to the source material. A number of new technical changes and additions sell the world better as well. Rockstar has added three times the number of light sources, volumetric light pollution and a dynamically adaptive field of view to the new-gen editions of Grand Theft Auto V. These improvements dramatically improve visual fidelity and make it a joy to explore a familiar setting with what essentially amounts to a new set of eyes. New stings, commentary and talk-back segments, plus 162 new songs doubles the amount of audio in the game, broadens the satire and cuts down on the repetition. Grand Theft Auto V for new-gen consoles is by far the most rigorous and sweeping cross-generational update we’ve seen – and at this point in the lifecycles of the PlayStation 3 and Xbox 360, we're unlikely to see such a move again. Grand Theft Auto V for new-gen has been more than a year in the making, but it’s evident that not a single moment has been wasted. Easily recommended for new and returning fans alike. Grand Theft Auto V for new-gen is without a doubt the best way to experience one of the biggest releases of the last half decade. Ups Substantial technical improvements make the world a joy to explore. First-person mode draws you into the game in a way the series never has before. Updated stations keep things fresh. Downs Still the odd AI hiccup.